The first thing to do before arrival at the city is to exchange our big wealth. Of course, you can do it directly on the site, but still it is more profitable to do it at a good exchange rate and in a calm atmosphere. What shall you exchange for? Throughout the Swedish territory only one currency is valid - Swedish Krona (SEK). By the way, two other Scandinavian countries also have Krona, they are Denmark and Norway. But they are two completely different kinds of Krona, which are denoted as DKK and NOK. 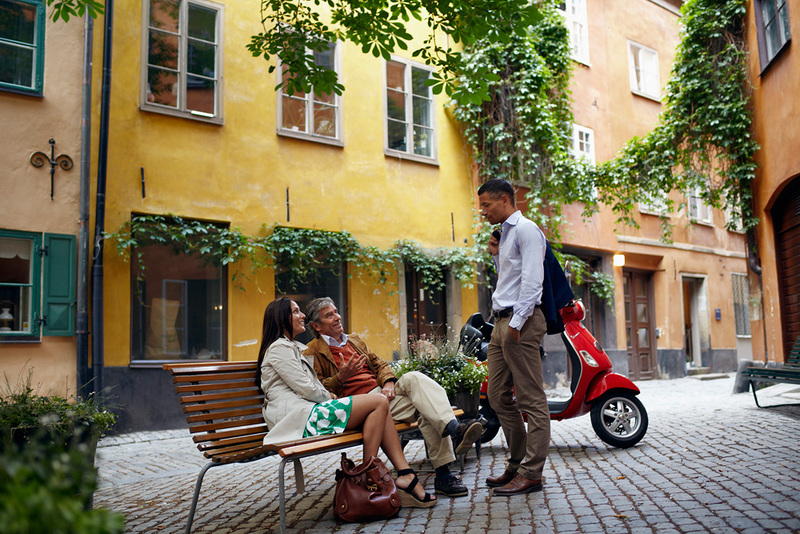 It is clear now, so we feel free to exchange our USD10 and get SEK84.77 – budget with which we will search for Stockholm’s exciting offers. One of the key things you need to understand upon arrival at the city, is a means of transportation. Prices of public transportation can easily scare an unprepared tourist: a taxi ride will cost no less than USD13, if you arrive by your private car, there is a risk to spend all your budget on... 6 litres of petrol. The only option that remains, even though it is also far from being cheap, is a public transport. Local buses evaluate their services an average of USD4, the same is the fare for the subway (which is called tunnelbana and denoted by the letter «T», instead of the usual «M»). The most exciting thing is that in the local subway we give hard-earned money not only for usual fare, but also for experience which is over and above there. 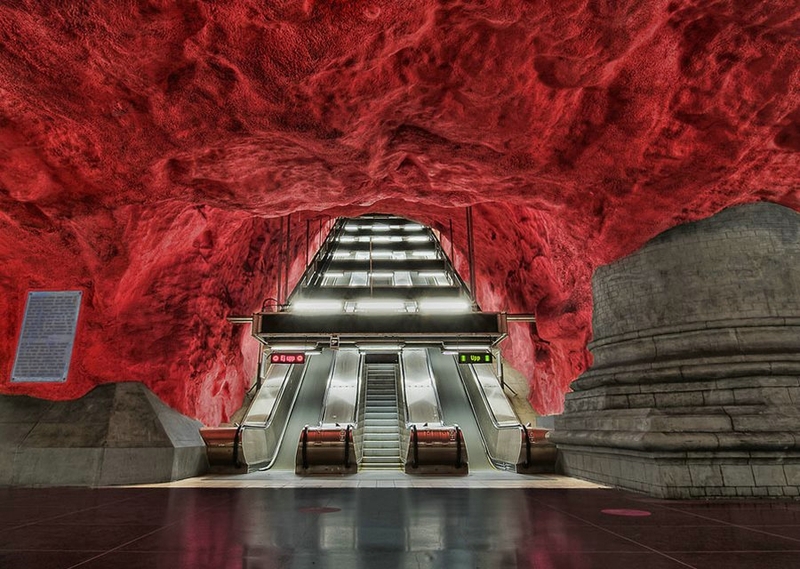 Stockholm subway is not just a means of transportation, but a kind of art gallery where more than a hundred artists embodied their wildest creative ideas. Hallonbergen station's interior is covered with art intending to mimic kids' paintings; Kungsträdgården station meets passengers with antique statues and fountain; Tekniska hogskolan station dips into space and science; and the main station T-Centralen was literally built inside the rock. Having admired the world most unusual subway, use it to go to the station Gamla Stan. 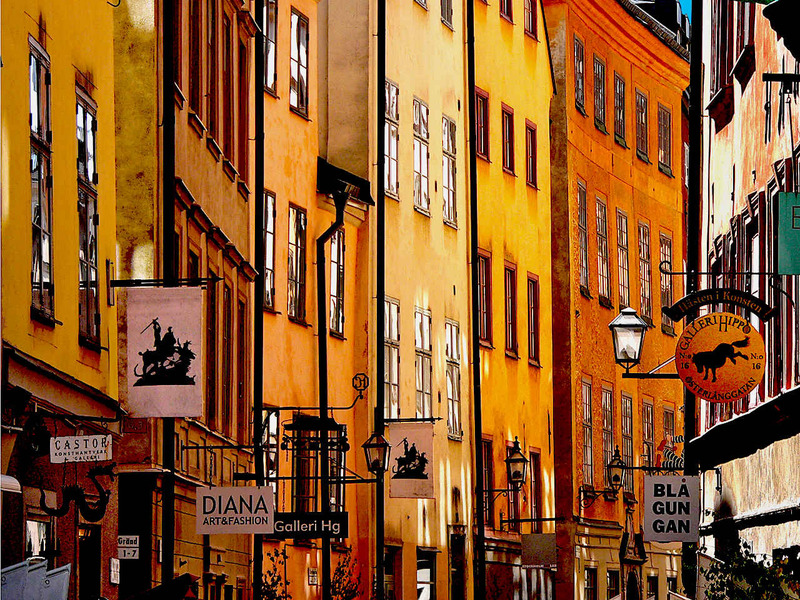 Old Town (Gamla Stan) is one of the foremost attractions and the oldest part of Stockholm located on the island of Stadsholmen. Here you will forget about transport, since it is a living pedestrian-friendly museum where you can explore local medieval alleyways, cobbled streets and archaic architecture. This, incidentally, is useful both for health and for budget. Stortorget is the name of the scenic large square in the centre of Gamla Stan. The most grandiose city and Christmas fairs are held there. The real stars of the square are popular at any time of the year: they are houses under numbers 18 and 20. Even the local inhabitants cannot reply why this red and orange sweet couple is a symbol of Stockholm, but selfie on their background is a must-have for all the tourists. Maybe the secret is that these iconic buildings are the brightest, they simply cannot be ignored. Here you can buy a souvenir magnet with images of Stockholm's symbol, but USD8 is too pricey, so we just get satisfied with a selfie on the background of houses and proudly move on. The same old town offers for free another traditional spectacle - daily changing of the guard at the Royal Palace, which takes place every day in warm season (from May to September at 12:15 p.m. on weekdays and at 01:15 p.m. on weekends). Of course, if the ceremony is not attended by important guests, everything is done without too much pathos in ordinary everyday manner. But always with an orchestra! In cold weather, the action is not cancelled, just happens a little less often: on Wednesdays and Saturdays at 12:00 p.m., and on Sundays at 01:00. p.m. Here you can admire the gorgeous views of the sea opening from the Royal Palace. 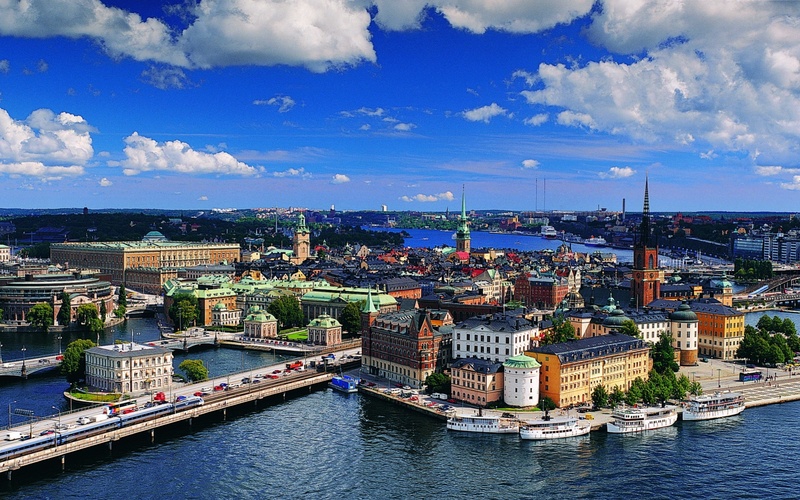 There are dozens of postcard perfect viewing points for panoramic views of Stockholm. For the ultimate bird’s eye view, go to Slussen promenade where there is an observation deck at a height of 38 meters. There are two ways, and in spite of the fact that one of them is free, we recommend to spare no expense. Free path leads to the ladder that you can climb up to the observation deck. A payable way is an ancient Katarinahissen (Katarina Elevator), built in 1881, it costs about USD3. Though spiritual food is rather supportive, but our trip will not last long without at least a modest snack. Therefore, we are moving in search of a tasty and budget-friendly food. The real disaster for the low-budget traveller is that Stockholm does not have cheap street food. And this is against a background of the sky-high prices at local restaurants: even the most inexpensive one will cost at least USD12, dinner for two with wine is at least USD80. Therefore, even the city residents often opt for American fast food in search of reasonable prices: for instance, at McDonalds for a standard set - Big Mac, French fries and Cola – you will have to pay USD8. There is another option that can be tested: eateries owned by the Turks. 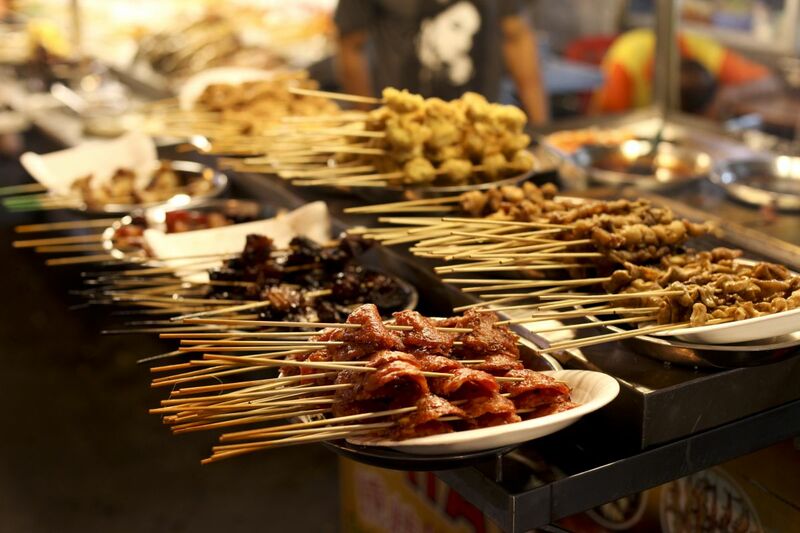 There prices are often much lower, and the food is tasty and indigenous. The first thing you definitely need to order being in Stockholm is famous meatballs. This is a signature dish of the Swedes, which they eat with anything, even jam! High price have only one advantage, here you can easily stop drinking and smoking, just so as not to blow your budget on bad habits. And this can happen in a jiffy: 0.5 litre of local beer costs an average of USD8, a pack of cigarettes - USD7. Having enjoyed a delicious dinner, let’s have some more spiritual food and explore the Swedish culture and traditions. There is no better place for it then Stockholm's museums, some of which have free admission hours once a week, so you have a chance to get there free of charge. For instance, on Fridays from 4:00 p.m. to 6:00 p.m. the architecture museum, Arkdes welcomes visitors; and on Wednesdays from 5:00 p.m. to 8:00 p.m. the Nordic Museum is glad to meet aficionados of Swedish culture.